I'm posting this bread hoping that it will inspire other TFL members to bake it, because it is a great bread. It took me a long time till I decided to make it and now I regret that I haven't done it sooner. 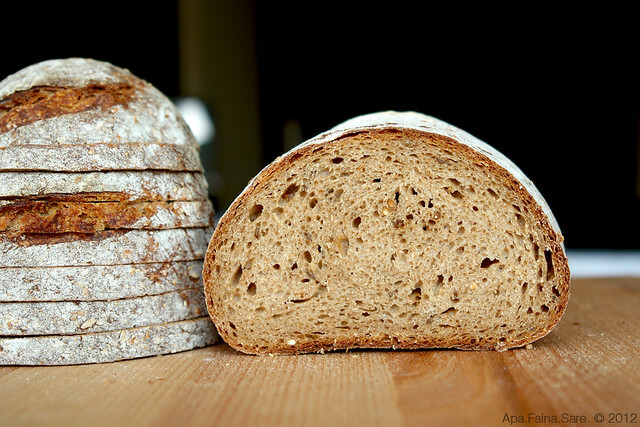 Full of flavor, easy to make and friendly with rye beginners, it is light and healthy and for my taste, it's perfect. - I didn't used commercial yeast. - I increased hydration from 68% to almost 73%. 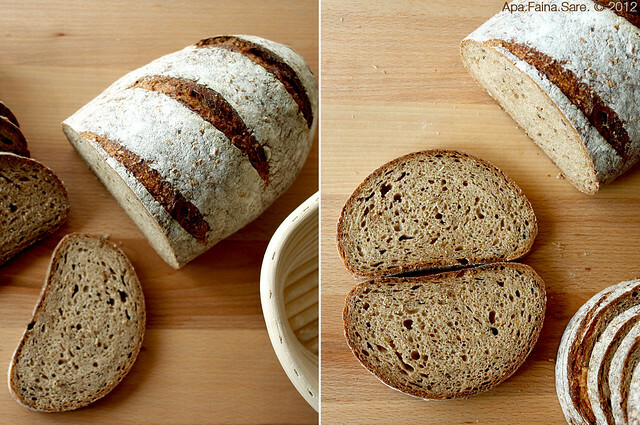 -Instead of white flour I used a mix of 41% Malthouse Doves Farm (which is a mix of Brown Wheat Flour, Malted Wheat Flakes 15%, Rye Flour 3.6% and Malt Flour), 41% Whole Wheat Doves Farm (but I removed the big brans) and 18% white flour austrian W 480 (mehl griffig). For those who don't have the book, eric (ehanner) posted the formula on his blog, a few years ago (here is the link to the formula). For the quantities and details of the method I used, please visit my romanian blog (translation available), link here. Hope you'll make this bread as soon as you can! Happy baking to all of you! 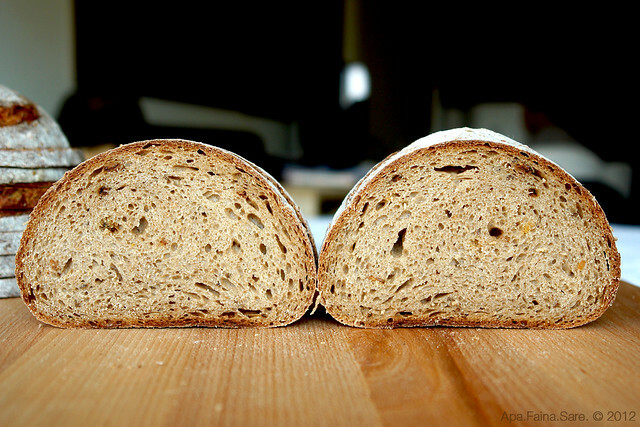 the crumb displays amazing dough strength through control of the fermentation; and almost 44% rye flour in the grist. Just a note to anyone reading the post on your own blog: the translation to English makes reference to "cumin" in the main text, where Caraway should appear. Anyone who hasn't seen Codruta's blog, here is my recommendation: pay a visit, it's a gem! Hi Andy, thank you so much for your generous comment. You are right about cumin-caraway, unfortunatelly, I can't change the automatic translation. I didn't realised the crumb shows good strength through control of the fermentation. I'm very much following my instincts and I'm not able to explain the teory behind the fermentation. I watch the dough and take decisions based on experience and feelings, not on a real knowledge (of maybe there is some knowledge, but not as much as I would like) Truly, I can't wait to come to you and talk about this. Be prepared, cause I have a tons of questions. Codruta, you are a master! Beautiful beautiful bread. Maybe Andy should be headed to Romania so that you can teach him !!!! Hi Codruta, fabulous looking loaf. Can you shed more color on the baking stone used? It seems thick and similar to a patio block - What type of stone is it, any input would be welcome... thank you! Hi, Nick. Thank you for your interest. The baking stone is a granite stone (untreated with chemicals) and it has 2 cm thick. I never used something else, so I can't compare, but I'm pleased with it. In the last 3 anh half years I changed 3 or 4 pieces: the first was to thin, the second broke because I removed from the oven when it was still hot and I cleaned it imediately with a wet cloth (I've learnt my lesson then), the third was too large and the air didn't circulate well and the last, that one you see, I have it for more than a year and till now it worked fine. Hope my answer has the info you wanted, if not, ask me again. think Andy will learn a thing or two from you. Your greads are just beautiful and so well crafted - they have to taste great. Took the words right out of my...fingertips, brownman. And if Andy feels you've got nothing on his rye chops, so to speak, you can certainly show him the way around a camera. Beautiful baking and photography! I went to the blog site but don't see how to get a translation. On my blog, if you look on the right, below my picture my FB page an the Rss feed, you can see the word "Translate" and some flags. Pick a flag or select the language you want. Excellent looking loaves. 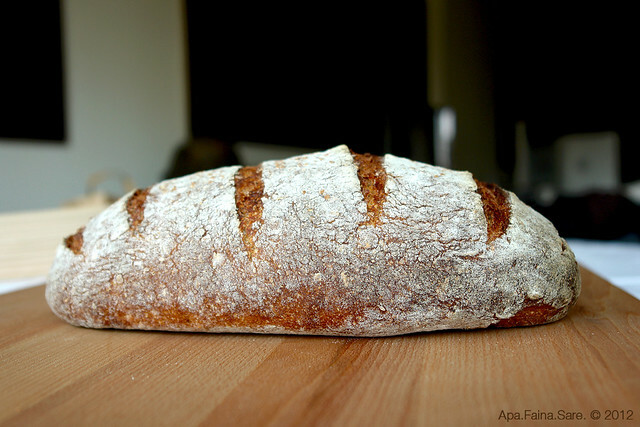 Your crumb looks perfect and beautiful scoring. Beautiful loaves. I love the dusting of flour and your scoring. The shape is also very nice. 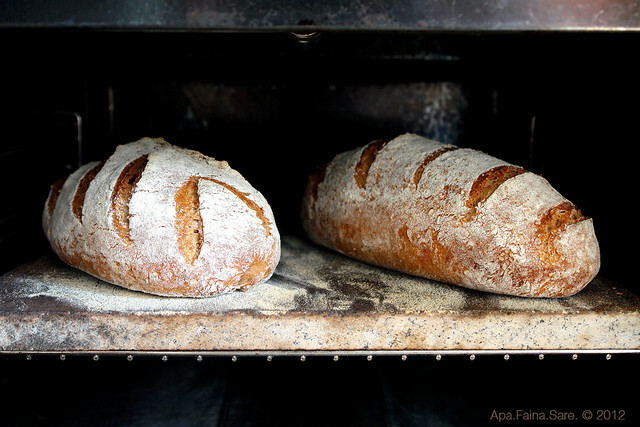 This will have to go onto my 'to bake' list and added to my rye collection. Those certainly are lovely loaves of rye. Looks like you got maximum oven-spring, great crust and crumb and nice scoring (I see some ears). It doesn't get better than that. Hi Codruta, I couldn't resist those loaves so I followed your advice and made them yesterday. I followed Eric's recipe, with the yeast. I just decided to make them the nite before at 11 pm. So I put together the starter, rye and water. Next morning mixed final dough and by 2 pm I had the most beautiful loaves, with nice crust and lovely soft crumb. Got rave reviews from a lot of people. This one is a keeper and will definitely try again, may be without the yeast when I have more time. Unfortunately, I have not figured out how to post pictures yet. I hope more people will try this one and thanks to you and ehanner.